I'll keep adding things as I find the, but here are some links to things you can find in Oregon that are delicious. All kinds of seafood, fresh, vacuum packed and live. All the prices were amazing and the selection was great. This family owned business is serious about sustainable, local seafood. Oregon Field Guide even covered them! Available at the Beaverton Farmer's Market and stores around the area. The Flying Fish Co. is run out of a food truck that is filled freezers and refridgerators. Don't let this put you off though. This is no side-of-the-highway fish monger. Lyf is diligent about his fish. Follow @flyingfishco on twitter for daily updates on what his is stocking. 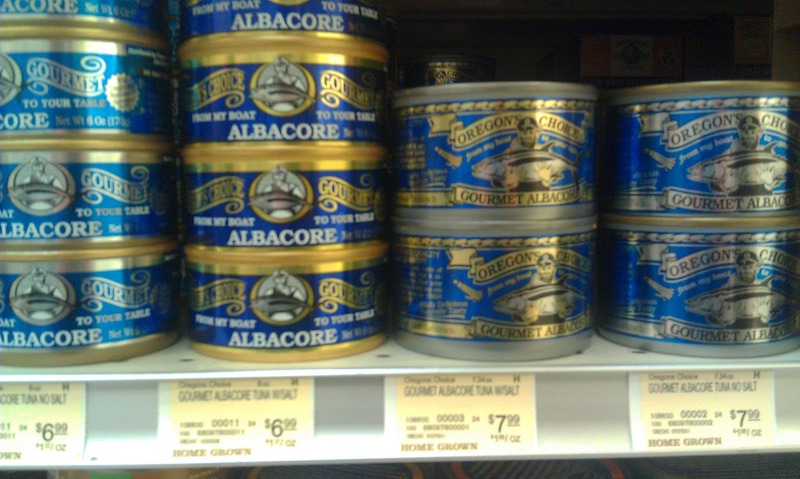 Canned Tuna, but not like you've had before. This is a chunk of tuna in a can. Based in Newport, Oregon, this family owned company uses only hook & line methods and is certified by the Marine Stewardship Council. Available at New Seasons. Great prepared as tuna balls. The restaurants and the boats are family owned. They can and sell their own tuna, salmon and crab. At the restaurant you can get fresh fish or eat lunch there. The crab cocktail is outstanding. A wide variety of pork products, including outstanding bacon. I've only found them at the PSU Farmer's Market, but they may be in other places. When we bought our whole pig, we got it from Payne Family Farm. It was some of the best pork I'd ever eaten in my whole life. Available from Eat Oregon First and various restaurants around town. Run by Susie and Dan Wilson out of Canby, SuDan Farms lamb is available direct from their farm and you can find it at various restaurants around town. We found them at the PSU farmer's market and ordered a whole lamb for our Eating Babies meal two years ago. You can also read about impromptu braised lamb shank using SuDan farms lamb. We'd driven past Ford Farm many times on our way to Pumpkin Patch Farm on Sauvie Island. I'm glad I finally called to find out about their beef. We ended up getting 1/4 cow, and it was outstanding. They are extremely small scale producer and do home delivery. Their highland cattle are family raised and delicious. "Eliza chickens", as we call them. Admittedly, Eliza is a good friend. It just so happens she is a good friend that humanely raises delicious chickens and turkeys. Available by phone only. My go-to place when the farmer's markets are not open or when I don't feel like dealing with the crowds. Just outside the city on Sauvie Island makes it very convenient. The selection is good, the produce is labeled so you know where it comes from, and the quality is very nice. Canned beans, not fresh. Mass produced yet local and sustainable. Available at Whole Foods, etc. They have simply the best peaches I've ever tasted. I've only ever seen them at the St. John's farmer's market. These are the kind of peaches you want to buy cases of to can so you can eat them all year. A great place for berry picking. Super popular in the summer for live music on Thursdays. Warm bread with Stone-Buhr wheat. "Local" is relative when it comes to something produced on such a massive scale, like wheat. But Stone-Buhr is about as good as it gets. Available in almost any grocery store in the normal flour isle, not just the "natural foods" section. Read more about the struggles of durum wheat in Oregon. The only beer I've found that is 100% Oregon ingredients. The entire "Chateau" line is 100% local. I like the Orgasmic Ale. Only available at their pubs and breweries. 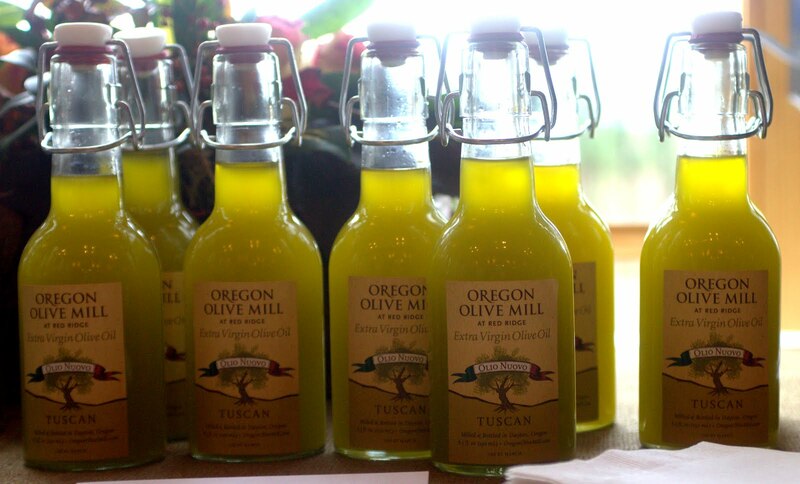 The most successful of the fledgling Oregon olive oil producers, the Oregon Olive Mill has started to make a name for itself. The olive oil is wonderful, and the farm itself is beautiful too. Read about the challenges of the Oregon olive industry. 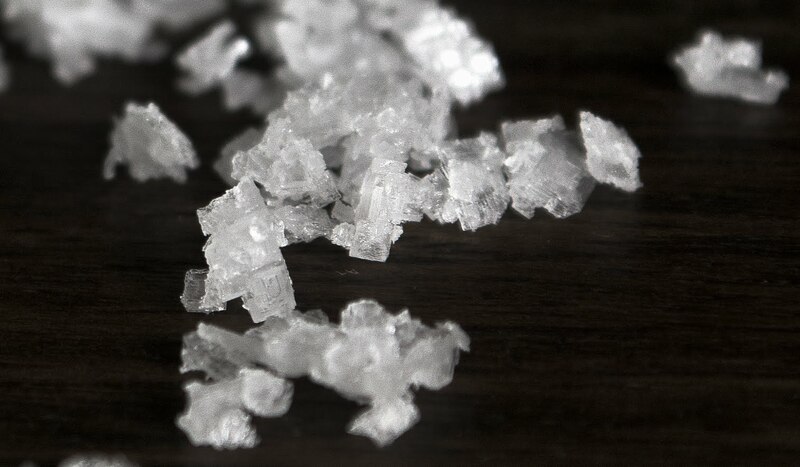 Crystals of Jacobsen's Oregon Salt. The only salt producer in the entire Northwest that actually gathers water locally and processes the water locally. Having just started in October, 2011, Jacobsen Salt filled a niche that no one else was. Available at New Seasons, Elephant's Deli, and other places around Portland as well as online. I had the chance to sit down and talk Oregon Salt with Benjamin Jacobsen.